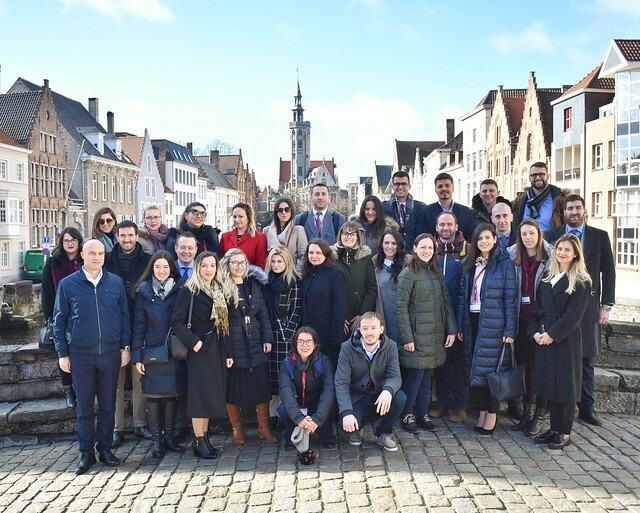 From 11 to 22 February 2019, the College of Europe Development Office successfully implemented the second edition of a two-week training programme on "Public Administration Reform and the EU" in Bruges and Brussels. This course took place in the framework of the EU-funded project "EU Scheme for Young Professionals in the Western Balkans" (www.eu4wb6.com), implemented by the British Council. Thirty young civil servants attended this course — five from each of the following countries: Albania, Bosnia and Herzegovina, Kosovo*, the Republic of North Macedonia, Montenegro and Serbia. The course focused on strengthening knowledge and know-how related to Public Administration Reform processes in the context of EU accession negotiations. It also aimed at promoting regional cooperation, networking, and peer learning. This was achieved through interactive training sessions and simulations, fruitful debates and study visits to the European Commission, the European Parliament, and the Council of the EU. Also worth mentioning is that the course included a panel debate on: "Regional cooperation, why does it matter and how to contribute to the process further?”. During this event, experienced speakers, representatives of the European Commission and of five embassies of the aforementioned countries enriched the programme with their insightful presentations. The College of Europe Development Office would like to thank the participants and the trainers for making this year’s edition a success story!